Satellite image of the Great Barrier Reef which stretches along more than 2,000 km (1,200 miles) of Australia's eastern coast. 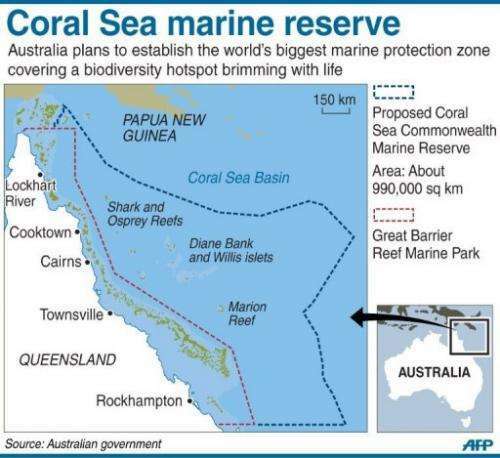 The Australian government says it plans to establish a huge marine protection zone to safeguard a large part of the Coral Sea, a biodiversity hotspot brimming with life. The Australian government has said it plans to establish the world's biggest marine protection zone to safeguard a huge swathe of the Coral Sea, a biodiversity hotspot brimming with life. The proposed Coral Sea Commonwealth Marine Reserve off the northeast coast of Australia would cover about 990,000 square kilometres (380,000 square miles) -- an area more than one-and-a-half times the size of France. "Australia's vast oceans provide a source of food and resources and are a place of recreation. But we cannot afford to be complacent," Environment Minister Tony Burke said. Under the plan, oil and gas exploration would be banned and new limits would be imposed on fishing. 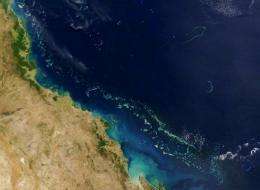 The environmental significance of the Coral Sea within Australia's Exclusive Economic Zone lies in its diverse array of coral reefs, sandy cays and deep-sea plains and canyons, Burke said. "There is no other part of Australia's territory where so much comes together -- pristine oceans, magnificent coral, a military history which has helped define us and now a clear proposal for permanent protection," he said. A recent study found that the Coral Sea, which stretches from the Great Barrier Reef to the waters of the Solomon Islands, Vanuatu and New Caledonia, was home to many unique and endangered species. It is also one of the last remaining places on the planet brimming with large predatory fish such as sharks and tuna. Burke said the side of the reserve closest to Australia's coast had taken into account recreational and charter fishing, and the proposed reserve was remote, with the nearest point 60 kilometres from the shore. Environmental groups, which have pushed for the Coral Sea to be safeguarded, said the proposal was a good start but fell short of fully protecting the area's fragile coral reefs and spectacular marine life. "We welcome the exclusion of oil and gas extraction and the ban on fishing gear that destroys seafloor habitats," said Imogen Zethoven of the Pew Environment Group. "However, protection levels need to be stronger, particularly in vulnerable areas, to ensure the Coral Sea's long-term protection." James Cook University Professor Terry Hughes said it was a welcome step towards protecting "one of the last remaining wild places in the sea" but that under the proposal, fishing would be banned in only 51 percent of the park. The government will hold a three-month consultation period before making a final decision. As a card carrying AGW skeptic. I approve of this Idea, this is a good move this is a paradise and needs protection.